A cholesteatoma (ko-less’-tee-a-toe-ma) is rare, especially in children. Typically, it is a growth in the middle ear, in just one ear but it is possible for it to affect both ears. This growth can be present behind the eardrum at birth or it can develop later, sometimes as a complication of middle ear infections. A cholesteatoma is not a tumor and is not cancer. What is it? A cholesteatoma is made up of layers of skin tissue (epithelial) tissue. Just like an onion, it starts out small and grows by adding layer on top of layer. Each layer is made of skin tissue (similar to the yellow dot on the ear diagram above). The really serious issue is that the cyst can eat away at whatever it touches. If a cholesteatoma is not treated, it can invade the tiny bones behind the eardrum (ossicles), dissolve part or all of the structures in the middle ear, and as a result, cause hearing loss. If it grows large it can even dissolve through the bone separating the middle ear space and the brain. Serious potential complications of cholesteatoma include hearing loss, brain abscess, dizziness, facial paralysis, meningitis, and spreading of the cyst into the brain. Families are encouraged to visit http://www.bornwithcholesteatoma.net/, which provides parent-to-parent sharing, support and valuable information about dealing with congenital and acquired cholesteatoma and its effect on children. What are the symptoms that suggest a cholesteatoma might be present? A draining ear and/or hearing loss can be symptoms but sometimes occur with ear infections. Ear infections that can cause conductive hearing loss and ear drainage are very common, especially in young children. When children go to the doctor with draining ears, it is up to the physician to rule out that a rare and serious cholesteatoma is not the cause. Sometimes a cholesteatoma is right behind the eardrum or has grown through the eardrum and the physician can easily see it. It can also develop in the space in the upper part of the middle ear where the ossicles are, making it impossible to see. 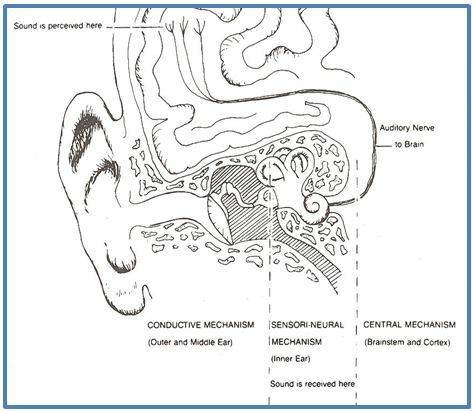 In those cases, the only symptom may be increasing hearing loss as the ossicles are dissolved by the cholesteatoma (see conductive hearing loss, below). Why/how does a cholesteatoma develop? a) From birth: The less common form of this rare disease occurs when a baby has a developmental abnormality causing him/her to be born with a small cholesteatoma that grows in the middle ear space. The reason for this developmental abnormality is unknown however it is not believed to run in families (not a genetic disorder). b) Acquired after birth – How cholesteatoma growths form: There is a structure that goes between your throat and your middle ear space called the Eustachian tube. It regularly opens, letting air into the middle ear. The lining of the middle ear absorbs air. When the throat is a bit swollen such as when you get a cold, the Eustachian tube doesn’t open as often as it should. When it does open you may feel your ‘ears pop’ sometimes. The ‘stuffy ears’ you feel with a cold happens because the middle ear tissues have absorbed air and the Eustachian tube cannot open to let more air in. This causes the eardrum to be pulled inward. Eventually, if the Eustachian tube doesn’t open and let in air, fluid from the tissues of the middle ear will get drawn out of the tissues into the middle ear space. Sometimes this fluid becomes infected by bacteria that have traveled from the throat up the Eustachian tube to the middle ear space. Once the eardrum returns to a more normal position, even if there is fluid behind it, the earache gets better. If ear infections go untreated the infection (similar to pus) in the middle ear space can grow and grow until it bursts the eardrum, resulting in a draining ear. 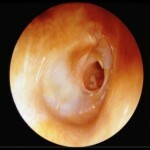 This hole can be very ragged, with uneven edges that make it hard for the eardrum to heal smoothly. Sometimes there are parts of the eardrum tissue that do not heal cleanly and these bits extend into the middle ear space, resulting in the risk for skin tissue to begin to grow in the middle ear, layer upon layer to develop a cholesteatoma. When a person has had multiple burst eardrums the eardrum may end up with weak spots where these holes have healed. 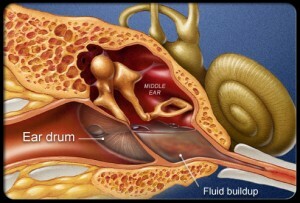 When the Eustachian tube cannot open, the eardrum is pulled inward into the middle ear space as the pressure increases. A weak spot on the eardrum is likely to retract farther, developing a pouch or sac that can enclose in upon itself and become the start of a cholesteatoma. Cholesteatoma and ear tubes: When a child has had tubes inserted, a small cut is made in the eardrum for the tube to fit into. In about 1/100 children who get ear tubes a cholesteatoma develops once the tube falls out because the eardrum doesn’t heal normally and instead layers of skin can grow on the bits of the eardrum facing into the middle ear. The problem is not the ear tubes, but the eardrum that has been weakened by recurrent or ongoing ear infection problems. Children who get ear tubes early and subsequent tubes inserted without delay when needed, are much less likely to develop a cholesteatoma. Cholesteatoma prevention: The secondary effects of ear infection, including infection spreading into the mastoid (the bump behind your ear) and the development of cholesteatoma was once a leading cause of death in children. Today’s modern medicine can identify cholesteatoma growths and treat them early thereby preventing the most serious hearing loss and other complications, but it is still necessary for the family or individual to seek treatment. Persons without access to medical care or those who do not believe in accessing Western medicine for religious/cultural reasons remain at high risk for cholesteatoma growths to develop if they do not seek treatment for recurrent ear infections. What is the treatment for a cholesteatoma?Surgery is used to remove the cholesteatoma. 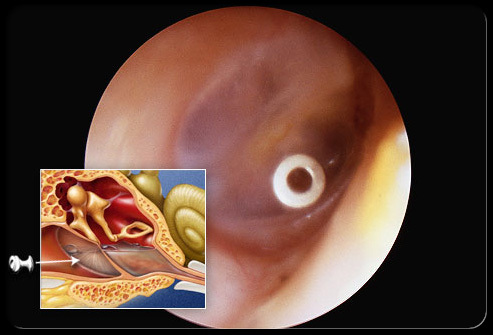 Since the source of the problem in many cases is Eustachian tube dysfunction (ears don’t ‘pop’) in about ½ – ¾ of cases the cholesteatoma comes back and additional surgery is needed. 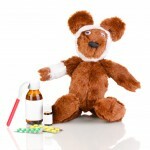 It may be necessary, after surgery, for the ear to be cleaned as needed by a health care professional. Conduct: to channel, lead or convey from one point to another. A conductive hearing loss happens when sound cannot successfully get from the air, through the outer and middle ear, to be able to be processed by the inner ear and then recognized by the brain. How our ears work: In order to understand what a conductive hearing loss is, it is important to know a little about how we hear. The picture of the parts of the ear will help you understand the chain of events that happens when we hear sound. The outermost part of the ear, the part that we can see, is called the pinna. At roughly the center of the pinna is a channel (called the ear canal) into which the sound travels on its way to what is called the eardrum (also known as the tympanic membrane). The eardrum vibrates when sound strikes it, causing a chain of extremely tiny bones (called ossicles) that are located on the other side of the eardrum to vibrate. The chain of ossicles is located in an air-filled chamber called the middle ear space. The vibration of the last ossicle in the chain causes a small membranous section of the bony inner ear (called the cochlea) to also vibrate. This vibration causes vibration of fluid that is inside the inner ear, and the vibration stimulates delicate cells inside the cochlea to respond and in turn send a message to the brain that a sound has occurred. If a problem interferes with the sound vibrations reaching the inner ear, we say that there is a conductive hearing loss. Depending on the extent of the problem, a person with a conductive hearing loss might have difficulty hearing only soft sounds or the person have difficulty hearing typical conversation. What causes conductive hearing loss? There are many problems that can interfere with sound reaching the inner ear and cause a conductive hearing loss. For example, if a person has a build-up of earwax in the ear channel that is enough to interfere with the sound reaching the eardrum, that person would have a conductive hearing loss. If you hold down the tabs of your ears with your index fingers to close off your ear canals you will have caused a conductive hearing loss. A person born with a malformed ear in which the entrance to ear canal is closed off (atresia, microtia), would have a conductive hearing loss because the malformation would prevent sound from entering the ear normally. If the ossicles are malformed or damaged, such as what can happen if there is a cholesteatoma, they wouldn’t transmit sound well from the middle ear to the inner ear causing a conductive hearing loss. This article is specifically about two other causes of a conductive hearing loss: cholesteatoma and chronic middle ear infections. How much hearing loss is caused by a cholesteatoma? It depends on how much of the ear structures the cholesteatoma has dissolved away. The hearing loss can range from 15 dB up to 60 dB and typically affects low pitch sounds more than high pitch sounds, although all hearing is likely to be affected. Read information on the relationship of listening and learning needs. You understand better if you can watch people as they speak, but this is hard as people turn their heads, move around, cover their faces with their hands, etc. It takes extra work to listen, even with this ‘borderline normal’ hearing loss. When you pay more attention, the effort spent listening takes away from ‘instant understanding’ meaning figuring out what was said takes a bit more effort too, along with the effort to listen. A child experiencing frequent ear infections will have hearing loss that can change from day to day. Those who have active ear infection along with a cholesteatoma are likely to have some conductive hearing loss that is always there and more hearing loss that fluctuates as their ear problems get better or worse over time. This inconsistency in the ability to hear makes listening extra challenging and can contribute to children learning to ‘tune out’ when there is noise or someone is speaking at a distance. Cholesteatoma usually affects one ear and causes conductive hearing loss in that ear. A hearing loss in one ear is called a unilateral hearing loss. 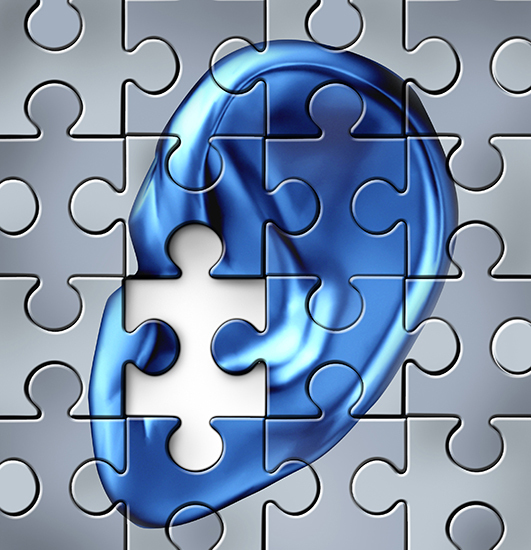 Read information specifically about listening and learning with unilateral hearing loss. If a child has a conductive hearing loss in one ear that won’t get better then it is appropriate for him/her to use a hearing aid on the ear with the hearing loss. There are different options for hearing aids for people with conductive hearing loss and your audiologist can help you decide if a regular hearing aid, bone conduction hearing aid, or a bone-anchored hearing device would be most appropriate. 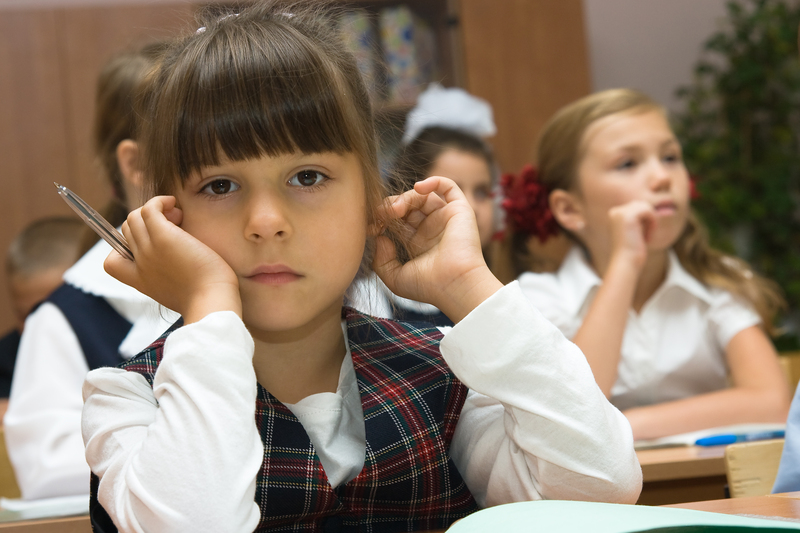 Children with unilateral hearing loss are at 10 times the risk for problems in school (learning, social, behavior) compared to their classmates without hearing loss. This surprises most people because they assume that if one ear hears normally that there will be no problem. Put a foam earplug in one ear and spend a couple of hours talking to someone and/or watching TV. You can hear but it is much harder to understand what is said where there is any background noise and it is very easy to miss subtle communication, like quiet comments or the sounds we make to let someone know that we are paying attention to what they are saying. It isn’t surprising that some children think others are talking about them because they can tell there is a conversation but cannot clearly understand what it is about. Depending on the experience that people in your school have had with children who have unilateral hearing loss, your child may receive regular support from a teacher of the deaf/hard of hearing or just preferential seating. A special teacher can make sure the classroom teacher understands how unilateral hearing loss affects classroom understanding and can identify the need for a classroom listening device, like a classroom amplification system or a personal FM system. Your child will benefit from understanding the types of situations that are most challenging and hearing tactics or self-advocacy strategies he can use to ensure that he is able to get the same access to teacher instruction and peer communication as his classmates. A special teacher can help your child learn these skills. The Children’s Home Inventory of Listening Difficultiescan help families/teachers/audiologists to identify challenging situations so that appropriate accommodations can be provided in the classroom. Children are most successful when families are fully involved in advocating for their child’s needs with the school team and supporting his success at home. For a printable version of this 5-page handout click: Cholesteatoma article. My thanks to Judith Blumsack, PhD, who collaborated with me during the development of this information. Information in this article is not intended as medical advice. Consult a physician for a medical opinion and appropriate treatment. Karen Anderson © 12/27/12 posted on Supporting Success for Children with Hearing Loss.